Posted by woodardr1 in West Elmira. The Home-schoolers group meets every Wednesday morning from 11 to 11:30 AM. We have a group of around 15 lovely kids from 3 – 12 years of age who enjoy the sessions every week. The subjects for these sessions range from entertaining to educational – including literature, Science/Math and social topics like organic farming. Our Valentine’s day special was a great hit with stories, games and stickers (Thanks to one of our parents who sweetened the session with their homemade Valentine’s day cupcakes!). The following week our group had a unique experience meeting and interacting with Elmira’s own Mark Twain! – Mr. Jim Ketcham who does an excellent Mark Twain impersonation made this possible and enabled the kids to learn about the great American author’s life and stories. On March 7th we introduced our Homeschooler group to organic farming, teaching them about healthy eating and having them learn about different vegetables and fruits that can be included in their everyday diet. 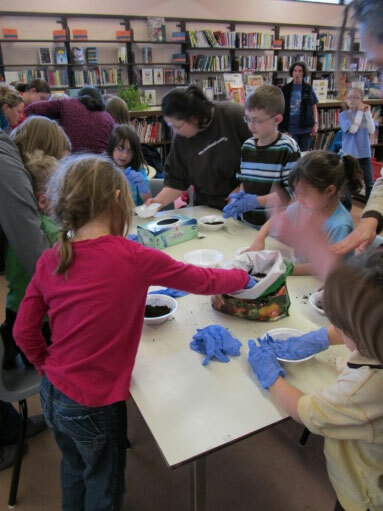 The children also had a lot of fun doing some “hands-on” gardening by planting a seed. Getting their hands dirty and planting their own personal seed which they could take home and care for was a great teaching moment. 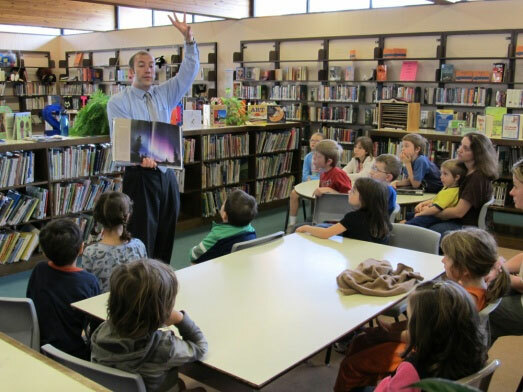 Weather-man special at West Elmira – Mr. Joe Pasquarelli from WETM news 18 conducted a 30 min session for the home-schoolers. It was a lively and an interactive session with kids actively participating and asking question to learn all about weather – rain, hail, snow and everything in between. For more information on the upcoming session please call Ms. Ahnece at West Elmira library at 607-733-0541 or visit us at http://www.ccld.lib.ny.us/elmira_west.htm. Toddler Storytime (Tuesdays 10:30 – 11AM) and Pre-schoolers Storytime (Thursday 10:30 – 11 AM) at West Elmira library is fun time for kids! Recently we had a puppet show – “Mrs. McPuppet” which was a roaring success. 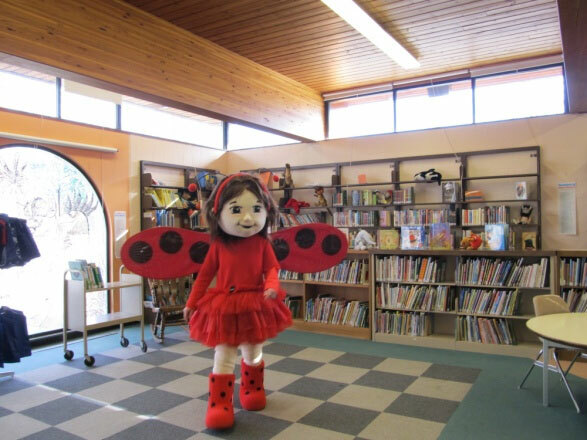 Lady bug visited the Storytime kids as well as students at Hendy Creek Elementary school to teach them about self-empowerment. We have a lot more planned for Spring. Stop in for lots of fun, games, scarves and stickers. And we have a special Monday night story time for the whole family. At the end of each story time session we conduct a “Silly dance contest” and winners get prizes. So make sure to stop by next Monday to win some goodies!! The members of West Craft group made beautiful bereavement buntings and blankets for Arnot’s neonatal/perinatal care. Their work was so well appreciated that they now have a fresh request for smaller and shorter blankets! Anyone interested in participating in the making of these blankets can contact Mrs. Mary Louise Fisher at West Elmira library for more details. 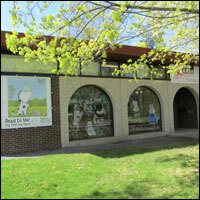 Furry friends program – April 2nd, 6:15-6:45 PM, for all ages. Local SPCA will be at the West Elmira library with a furry friend or two and gives us tips on how to care for and love these special creatures. Children’s book week – May 7th – 12th. Button bookmark and bracelet craft for kids on Monday, May 7. Kids have a choice of gifting either the bracelet or the bookmark they made during the craft session for their mom at Tea party to be held on May 12. Classic literature on CD’s – Only at West Elmira Library. Stop by to pick some for your next road trip! Posted by woodardr1 in Recommendations, West Elmira, Youth Services. West Elmira Library has been successfully set up to email notices. We now send notification of patron holds to their email. Also, we are sending courtesy notices to notify a patron that they have something coming due in three days. Don’t forget to check your email! How often are we looking for a meaningful way to explain death to our young children? 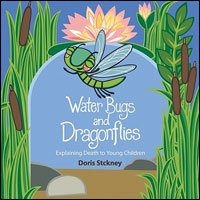 The author has adapted a fable about a water bug that changes into a dragonfly. The full color edition features delightful illustrations by artist Robyn Henderson Nordstrom of Cleveland, Ohio. It begins with a colony of water bugs. Every once in a while one seems to lose interest and clings to a pond lily, gradually moving out of sight and is seen no more. Her friends wait, but she never returns. The group would say “That’s funny! Wasn’t she happy here? Where do you suppose she went?” No one had the answer. The leader in the colony suggests that the next one who climbs up the lily stalk must promise to come back and tell everyone where he/she went and why. Everyone agrees. The group leader then finds himself climbing up the lily stalk – and his body changes; he loves his new form for he is now able to fly, and yet still be close to his friends, for he is right above them! However, he finds he is unable to keep the promise of coming back. His new form will not allow him to go underwater. He knows now that his friends will have to see for themselves what happens, and he will greet them at that time – and he flies away, filled with lightness and happiness! This book is a beautiful gift for those experiencing loss.